More than 70% of United States roadways are located in snowy regions. With these regions receiving at least five inches of annual snowfall, there is a definite need for anti-icing programs on U.S. highways. Anti-icing measures include the use of tailgate salt spreaders and liquid de-icers to improve roadway safety while keeping environmental concerns in mind. The programs require advance planning before winter storms arrive so that highways are in the safest possible traveling condition. Weather conditions exist in the United States and Canada which will continue to result in a need for effective winter management procedures. For the foreseeable future, salt and liquid deicers remain choice options for achieving de-icing goals. The need for effective snow management is important to the U.S. in combating approximately 800,000 injuries and more than 7,000 deaths that are weather-related each year. Statistics show that 17% of automobile crashes each year can be attributed to weather-related reasons. A recent study conducted in Iowa found that snow storms increased the crash rate on freeways by 1300%. Because motor safety issues have been linked heavily to bad weather, many states are initiating performances measure to evaluate the effectiveness of snow management procedures. The use of salt in anti-icing has become standard procedure. Salt does not present a threat to the environment if used properly and has been used to control ice and snow since the 1930s. With a spreading capacity of up to forty feet, tailgate salt spreaders are a good option for commercial use or homeowners. The spreader attaches to the tailgate of a truck without the use of pulleys, sprockets, chains, or belts. The tailgate salt spreader is precise and can be used to maintain driveways, recreational paths, parking lots, and roads. Another option in snow management is using a liquid deicer. 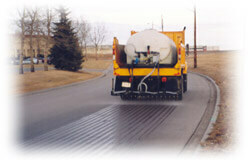 A liquid deicer is applied prior to a snow storm and prevents the bonding of snow and ice to a surface. Heat Wave liquid deicers can be used for winter maintenance purposes in areas up to -25 F. Liquid de-icers are great for anti-icing walking platforms, parking lots, doorways, ramps, loading docks, steps, and sidewalks. Advantages of liquid deicers include providing for low corrosion and being environmentally friendly. In contrast to other anti-icing methods, using a liquid deicer has shown to reduce negative effects on roadside trees and vegetation. Liquid deicers, such as the Heat Wave products, are leading the way to safer winter highways. With the public becoming more interested in winter maintenance procedures, some states and provinces now provide online information about their anti-icing programs. Public reports concerning snow-fighting services are now available via the internet for the province of Ontario as well as Colorado, California, West Virginia, Maryland, Washington, Nebraska, Idaho, Iowa, and Wisconsin. The Idaho Transportation department actually provides information in detail about their anti-icing program as well as the challenges created by the terrain and climate. Another useful safety measure in modern society is the “travel rate index”, which aids motorists in assessing the safety of roadways before traveling in unsafe terrain. As the techniques used for snow management progress, the public now has access to these updates so they can stay informed. Safety tips for power washing business. Save your time and energy with these great machines.